Abdel Massih, Ernest T. 1969. Tamazight Verb Structure: A Generative Approach. Dissertation Abstracts International: Pt. A, 0419-4209; Pt.B, 0419-4217; Pt. C, 0307-6075. PubLg: English. Cat: Berber language, tamazight, morphology. Abel, Hans. 1913. Ein Erzahlung im Dialekt von Ermenne. Abh. Kais. Sach. Akad. Wissensch., vol. 29. Leipzig. PubLg: German. Cat: texts, Nubian, historical linguistics, comparative linguistics. Abercromby, John A. 1917. The language of the Canary Islanders. Harvard African Studies 1: 95-129. PubLg: English. Cat: Berber language, canary islands. Abes, M. 1916. Premiere annee de berbere. Rabat. PubLg: French. Cat: Textbook, Morocco, grammar, sample texts, glossary. Abes, M. 1917, 1919. Les Ait Ndhir. Les Archives berberes, vol. 2, vol. 3. PubLg: French. Cat: ethnography, Ait Ndhir, Morocco, Tamazight. Abes, M. 1919. Chansons d’amour chez les Berberes. France-Maroc. PubLg: French. Cat: songs. Ahmad ibn Khauwas. 1881a. Dialogues francais-kabyles. Algiers. PubLg: French. Cat: sample texts, Kabyle. Ahmad ibn Khauwas. 1881b. Notions succinctes de grammaire kabyle. Algiers. PubLg: French. Cat: grammar, Kabyle. Aikhenvald, Aleksandra Yu. 1986. On the Reconstruction of Syntactic System in Berber Lybic. Zeitschrift fur Phonetik, Sprachwissenschaft und Kommunikationsforschung 39:5: 527-539. PubLg: English. Cat: syntax, morphology, personal pronoun, internal reconstruction. Aikhenvald, Aleksandra Yu. 1995. Split Ergativity in Berber Languages. St. Petersburg Journal of African Studies Sankt Peterburgskii Zhurnal Afrikanskikh Issledovanii 4, 39-68. PubLg: English. Cat: syntax, case, ergativity, clitics, pronouns. Akouaou, A. 1976. L’Expression de la Qualite en Berbere: le Verbe (Parler de Base: le Taselhit de Tiznit). These de Doctorat de Troisieme Cycle, Ecole Pratique des Hautes Etudes, quatrieme section. Paris: Sorbonne. PubLg: French. Cat: phonology, verbs, Tashlhiyt, Tiznit. Alalou, Ali and Patrick Farrel. 1993. Argument Structure and Causativization in Tamazight Berber. Journal of African Languages and Linguistics 14:2: 155-86. PubLg: English. Cat: morphology, word formation, causativization, syntax. Albino, J. 1859. Manual del lenguaje vulgar de los moros de la Riff. Cadiz. PubLg: Spanish. Cat: textbook, Rifian. Allati, Abdelaziz. 1999. Toponymie et reconstruction linguistique en Afrique du Nord et aux Iles Canaries. Langues et Linguistique 25: 9-53. PubLg: French (with English Summary). Cat: morphology, historical phonology, Canary Islands. Alojali, Ghoubeid. 1980. Lexique Touareg-Francais. Copenhagen: Akademisk Forlag. PubLg: French. Cat: glossary, Tuareg. Alvarez Delgado, Juan. 1941. Puesto de Canarias en la investigacion Linguistica. Monografias, Instituto de Estudios Canarios, Universidad de la Laguna, vol. 3, sec. 2., no. 1. PubLg: Spanish. Cat: historical linguistics, Canary Islands, bibliography. Alvarez Delgado, Juan. 1964. Inscripciones libicas de Canarias: Ensayo de interpretacion libica. La Laguna: Universidad de la Laguna. PubLg: Spanish. Cat: inscriptions, orthography, Libyan, Canary Islands. Amat, Charles. 1888. Le M’zab et les M’zabites. Paris. PubLg: French. Cat: ethnography, M’zab, Berber history, Berber language. Amrouche, Jean. 1947. Chants berberes de Kabylie. Paris. PubLg: French. Cat: songs, sample texts. Andrews, Clarence E. 1921. Berber Songs. Asia, vol. 21. PubLg: English. Cat: songs. Anonymous. No date. New Testament. London: Bible Society. PubLg: various Berber languages. Cat: sample texts, translations of New Testament portions, done by the Society since the early 1800s. Applegate, Joseph R. 1957. Berber Studies I: Shilha. The Middle East Journal II: 324-7. PubLg: English. Cat: bibliography, Tashlhiyt. Applegate, Joseph R. 1958. An Outline of the Structure of Shilha. New York: American Council of Learned Societies. PubLg: English. Cat: Berber language, Tashlhiyt. Applegate, Joseph R. 1959. Some Phonological rules in Shilha. Report of the Tenth Annual Round Table Meeting on Linguistics and Language Studies. Georgetown Monograph Series 12:37-42. PubLg: English. Cat: phonology, Tashlhiyt, morpho-phonology. Applegate, Joseph R. 1963a. The Structure of Kabyle. U.S. Office of Education. PubLg: English. Cat: Berber language, Kabyle. Applegate, Joseph R. 1963b. The Structure of Shilha. U.S. Council of Education. PubLg: English. Cat: Berber language, Tashlhiyt. Applegate, Joseph R. 1970. The Berber languages. In Current Trends in Linguistics, VI: Linguistics in South West Asia and North Africa, 586-664. Sebeok, Thomas A., Charles A. Ferguson, Carleton T. Hodge, Herbert H. Paper, John R. Krueger, Gene M. Schramm (eds.). The Hague: Mouton. PubLg: English. Cat: paralinguistics. Appoggi, -. 1933. Glossario dei nomi e delle terminologi piu in uso nei paesi abitati dai touareg degli Azgher. Tripoli. PubLg: Italian. Cat: glossary, Tuareg, Azgher. Aspinion, Robert. No Date. Maroc au 1/500,000. Carte linguistique. Rabat: Bureau des cartes de la Residence Generale. PubLg: French. Cat: dialect geography, Morocco, maps. Aspinion, Robert. 1937. Contribution a l’etude du droit coutumier berbere marocain. Casablanca. PubLg: French. Cat: lexicography, Morocco. Aspinion, Robert. 1941. Textes relatifs aux maladies dans le parler des Ait Arfa du Gurgon. Hesperis, vol. 18. PubLg: French. Cat: sample texts, Ait Arfa, Gurgon. Aspinion, Robert. 1953. Apprenons le Berbere. Rabat. PubLg: French. Cat: textbook, Tashlhiyt. Aucapitaine, Henri. No date. Etudes recentes sur les dialectes berberes de l’Algerie. Paris. PubLg: French. Cat: Berber language, bibliography. Avezac-Macaya, Marie Armand Pascal de. 1840a. Les documents recueillis jusqu’a ce jour pour l’etude de la langue berbere et sur divers manuscrits anciens en cette langue qu’il importe de rechercher. Bulletin Societe de geographie 2/14: 223-39. PubLg: French. Cat: manuscripts, bibliography. Avezac-Macaya, Marie Armand Pascal de. 1840b. Notes pour l’etude de la langue berbere. Paris. PubLg: French. Cat: Berber language. Bader, Yousef. 1983. Vowel Sandhi and Syllable Structure in Kabyle Berber. Studies in the Linguistic Sciences 13:1: 1-17. PubLg: English. Cat: phonology, vowels, sandhi, syllable structure, autosegmental phonology, Kabyle. Bader, Yousef. 1984. Topic in Kabyle Phonology and Morphology. Ph. D. Chicago: University of Illinois. PubLg: English. Cat: phonology, morphology, Kabyle. Bader, Yousef. 1985a. Kabyle Berber Phonology and Morphology: Outstanding Issues. Dissertation Abstracts International 45:7: 2082A. PubLg: English. Cat: phonology, morphology, autosegmental phonology, lexical phonology, Kabyle. Bader, Yousef. 1985b. Schwa in Berber: A Non Linear Analysis. Lingua 67: 225-49. PubLg: English. Cat: phonology, schwa, nonlinear phonology. Bader, Yousef. 1989. Consonant Sandhi Phenomena and Syllable Structure in Kabyle Berber. Lingua: International Review of General Linguistics 78:4: 295-311. PubLg: English. Cat: phonology, consonants, sandhi, syllable structure, obligatory contour principle, Kabyle. Bader, Yousef and Michael Kenstowicz. 1987. Syllables and Case in Kabylie Berber. Lingua: International Review of General Linguistics 73/4: 279-299. PubLg: English. Cat: morphophonology, syllable structure, relationship to case assignment, geminates, Kabyle. Barbara, Giuseppe. 1935. Arabo e berbero nel linguaggio italosiculo. Beirut. PubLg: Italian. Cat: comparative linguistics, Arabic. Barcelo, Carmen. 1990. ?Galgos o podencos? Sobre la supuesta berberizacion del pais valenciano en los siglos VIII y IX. Al-Qantara: Revista de Estudios Arabes 11(2): 429-460. PubLg: Spanish. Cat: Berber languages. Barth, Heinrich. 1853. Kelgeres-Lieder. Zeitschrift der Deutschen Morgenlandischen Gesellschaft, vol. 7. PubLg: German. Cat: sample texts. Barthe, Albert. 1952. Manual elementaire de conversation touaregue. Paris: Centre des Hautes Etudes d’Administration Musulman. PubLg: French. Cat: textbook, Tuareg, grammar, glossary, dialect geography, bibliography. Basset, Andre. No date a. Aires phonetiques homogenes et nom homogenes. In Proc. 3rd Int. Congr. Phonet. Sci., 258-61. PubLg: French. Cat: dialect geography, phonetics, maps. Basset, Andre. No date b. Quelques considerations sur la langue berbere. Le Monde non Chretien 11. PubLg: French. Cat: Berber language. Basset, Andre. 1923a. Le nom de la "porte" en berbere. Melanges Rene Basset 2: 1-16. PubLg: French. Cat: dialect geography, lexicography. Basset, Andre. 1923b. Notes de linguistique berbere. Hesperis 3: 69-81. PubLg: French. Cat: dialect geography, lexicography. Basset, Andre. 1925. Le nom de coq en berbere. In Melanges Lingustiques Vendryes, 41-54. PubLg: French. Cat: dialect geography, lexicography. Basset, Andre. 1926. Arabophones et berberophones dans le Nord-Marocain. In Rif et Jbala, 77-8. PubLg: French. Cat: dialect geography, Arabic, Morocco. Basset, Andre. 1928. Sur quelques termes berberes concernant la basse-cour. Memorial Henri Basset 1: 5-28. Paris. PubLg: French. Cat: dialect geography, lexicography. Basset, Andre. 1929a. Etudes de geographie linguistique en Kabylie. Paris. PubLg: French. Cat: dialect geography, Kabyle, Algeria, maps. Basset, Andre. 1929b. La langue berbere. Morphologie. Le verbe. Etude de themes. Paris. PubLg: French. Cat: morphology, verbs. Basset, Andre. 1932a. Note sur l’etat d’annexion en berbere. Bulletin de la Societe d’Archeologie Copte 33: 173-4. PubLg: French. Cat: morphology. Basset, Andre. 1932b. Notes sur le genre dans le verbe et dans le nom en berbere. In Cinquantenaire de la Faculte des Lettres d’Alger, 62-71. PubLg: French. Cat: morphology. Basset, Andre. 1933a. Note sur l’element demonstratif en berbere. Bulletin de la Societe d’Archeologie Copte 34: 213-15. PubLg: French. Cat: morphology. Basset, Andre. 1933b. Note sur les parlers zenaga. In Bull. Com. et. hist. sc. A.O.F., 319-32. PubLg: French. Cat: Berber language, Zenaga. Basset, Andre. 1933-45. Siwa et Aoudjila, probleme verbal berbere. In Melanges Gaudefroy-Demombynes, 279-300. Cairo. PubLg: French. Cat: comparative linguistics, Siwa, Aoudjila. Basset, Andre. 1934a. Note additionelle a T. Lewicki. In Revue des Etudes Islamiques, 275-305. PubLg: French. Cat: manuscripts. Basset, Andre. 1934b. Presentation de cartes linguistiques berberes. In Comptes rendus du Groupe Linguistique d’Etudes Chamito-Semitiques, 42-3. PubLg: French. Cat: dialect geography, maps. Basset, Andre. 1934c. Le systeme grammatical de berbere. Conf. Inst. Ling. Univ. Paris 2: 15-24. PubLg: French. Cat: grammar. Basset, Andre. 1934-5a. Autour d’une racine berbere. Annales de l’Institut d’Etudes orientales de la Faculte des Lettres de l’Universite 1: 73-6. PubLg: French. Cat: morphology. Basset, Andre. 1934-5b. Parlers touaregs du Soudan et de Niger. Bull. Com. Et. Hist. Sc. A. O. F. 1934: 496-509; 1935: 338-54. PubLg: French. Cat: dialect geography, Tuareg, Sudan, Niger, maps. Basset, Andre. 1934-5c. Siwa et Aoudjila, probleme verbal Berbere. In 279-300, Melanges Gaudefroy-Demombynes. Cairo: Imprimerie de l’Institut francais d’archeologie orientale. PubLg: French. Cat: Berber language. Basset, Andre. 1935a. Berbere inigi ‘temoin.’ Comptes rendus du Groupe Linguistique d’Etudes Chamito-Semitiques 2: 20. PubLg: French. Cat: lexicography. Basset, Andre. 1935b. La parente linguistique et le berbere. Revue africaine 76: 357-9. PubLg: French. Cat: historical linguistics. Basset, Andre. 1935c. Principes d’enquete linguistique appliques au berbere. Revue africaine 76: 369-71. PubLg: French. Cat: Berber language. Basset, Andre. 1935d. Probleme verbal dans le parler berbere de Siwa. Melanges Maspero 3: 155-9. Cairo. PubLg: French. Basset, Andre. 1936a. Atlas linguistique des parlers berberes. Algiers. PubLg: French. Cat: dialect geography, Algeria, lexicography. Basset, Andre. 1936b. Autour de E en Kabylie. Comptes rendus du Groupe Linguistique d’Etudes Chamito-Semitiques 2: 50. PubLg: French. Cat: phonology, Kabyle. Basset, Andre. 1936c. Deuxieme note additionnelle a T. Lewicki. In Revue des Etudes Islamiques, 287-96. PubLg: French. Cat: manuscripts. Basset, Andre. 1936d. Entretiens sur la determination et indetermination: berbere. Comptes rendus du Groupe Linguistique d’Etudes Chamito-Semitiques 2: 52. PubLg: French. Cat: syntax. Basset, Andre. 1936e. Presentation des premieres cartes d’un atlas linguistique en cours de realisation des parlers du Sahara et du Soudan. In Proc. 4th Int. Congr. Ling., 177-82. PubLg: French. Cat: dialect geography, maps, Sahara, Sudan. Basset, Andre. 1936f. Situation actuelle des parlers berberes dans le departement d’Oran. Revue africaine 76: 999-1006. PubLg: French. Cat: dialect geography, Oran, maps. Basset, Andre. 1936g. Siwa, Aoudjila et Imeghran a propos d’un rapprochement. Annales de l’Institut d’Etudes orientales de la Faculte des Lettres de l’Universite 2: 119-27. PubLg: French. Cat: comparative linguistics, Siwa, Aoudjila, Imeghran. Basset, Andre. 1936-9. Atlas linguistiques des parlers berberes. Algiere. Territoires du nord. Fasc. 1, Equides, Algiers. Fasc. 2, Bovins, Algiers. PubLg: French. Cat: Berber language. Basset, Andre. 1937. A propos d’un derive a nasale berbere. In Annales de l’Institut d’Etudes orientales de la Faculte des Lettres de l’Universite, 110-16. PubLg: French. Cat: phonology. Basset, Andre. 1938a. A propos de l’article de Schuchardt sur la rupture d’hiatus en berbere. In Act. XIX congr. intern. orient., 111-13. PubLg: French. Cat: phonology. Basset, Andre. 1938b. Le nom de l’etable en Kabylie et la flexion du Participe. Bulletin de la Societe d’Archeologie Copte 39: 177-8. PubLg: French. Cat: dialect geography, lexicography, Kabyle, morphology. Basset, Andre. 1938c. Note sur les parlers rifains du Zerhoun. IVe Congr. Fed. Soc. Sav. Afr. Nd. 2: 877-81. PubLg: French. Cat: Berber language, Rifian. Basset, Andre. 1938d. Un pluriel devenu singulier en berbere. In Comptes rendus du Groupe Linguistique d’Etudes Chamito-Semitiques, 19. PubLg: French. Cat: morphology. Basset, Andre. 1939. Formations accidentelles en berbere. In Comptes rendus du Groupe Linguistique d’Etudes Chamito-Semitiques, 45-7. PubLg: French. Cat: historical linguistics. Basset, Andre. 1939-41. Six notes de linguistique berbere. Annales de l’Institut d’Etudes orientales de la Faculte des Lettres de l’Universite 5: 16-40. PubLg: French. Cat: morphology, phonology. Basset, Andre. 1940a. Au sujet de berbere (t)ahyam(t)…. Comptes rendus du Groupe Linguistique d’Etudes Chamito-Semitiques 3: 91-2. PubLg: French. Cat: lexicography. Basset, Andre. 1940b. Quatre etudes de linguistique berbere. In Journal Asiatique, 161-291. PubLg: French. Cat: dialect geography, maps. Basset, Andre. 1941. La langue berbere dans les territoires du Sud. Revue africaine 85: 62-71. PubLg: French. Cat: dialect geography. Basset, Andre. 1942a. Etudes de geographie linguistique dans le Sud-marocain. Hesperis 29: 3-22. PubLg: French. Cat: dialect geography, Morocco, Tashlhiyt, Tamazight. Basset, Andre. 1942b. Sur le pluriel nominal berbere. Revue africaine 86: 255-60. PubLg: French. Cat: morphology. Basset, Andre. 1943-45a. Apparence et realite en berber. In Journal Asiatique, 417. PubLg: French. Cat: Berber language. Basset, Andre. 1943-45b. Sur la structure et la terminologie du verbe berbere. In Journal Asiatique, 442. PubLg: French. Cat: morphology. Basset, Andre. 1943-45c. Voyelle initiale du nom berbere. In Journal Asiatique, 456. PubLg: French. Cat: phonology. Basset, Andre. 1945a. A propos du parler berbere de Ghadames. Travaux de l’Institut des Recherches sahariennes 3: 137-40. PubLg: French. Cat: Berber language. Basset, Andre. 1945b. Sur la voyelle initiale en berbere. Revue africaine 86: 82-8. PubLg: French. Cat: phonology. Basset, Andre. 1946a. Berbere isnin ‘tous les deux.’ Comptes rendus du Groupe Linguistique d’Etudes Chamito-Semitiques 4: 19-20. PubLg: French. Cat: lexicography. Basset, Andre. 1946b. Le systeme phonologique du berbere. Comptes rendus du Groupe Linguistique d’Etudes Chamito-Semitiques 4: 33-6. PubLg: French. Cat: phonology. Basset, Andre. 1946c. Sur la proposition independande et la proposition relative en berbere. Comptes rendus du Groupe Linguistique d’Etudes Chamito-Semitiques 4: 30-2. PubLg: French. Cat: syntax. Basset, Andre. 1946-47. Tidma, terme kabyle pour designer les femmes. In Journal Asiatique, 176. PubLg: French. Cat: lexicography, Kabyle. Basset, Andre. 1947. Entretiens sur la mise a part: faits berberes. In Comptes rendus de Groupe Linguistique d’Etudes Chamito-Semitiques, 65-6. PubLg: French. Cat: Berber language. Basset, Andre. 1948a. De nouveau a propos du nom de l’ile de Fer. In Onomastica, 121-16. PubLg: French. Cat: comparative linguistics, Canary Islands. Basset, Andre. 1948b. Ecritures libyques et touaregues. In Notices sur les caracteres entragers anciens et modernes, 135-43. Fossey, Charles (ed.). Paris. PubLg: French. Cat: orthography, Libyan, Tuareg, Tifinigh. Basset, Andre. 1948c. Etymologies berberes. Comptes rendus du Groupe Linguistique d’Etudes Chamito-Semitiques 4: 79-80. PubLg: French. Cat: historical linguistics, etymology. Basset, Andre. 1948d. La langue berbere au Sahara. In Cah. Ch. Foucauld., 115-27. PubLg: French. Cat: dialect geography, maps. Basset, Andre. 1948e. La proposition sans verbe en berbere. Comptes rendus du Groupe Linguistique d’Etudes Chamito-Semitiques 4: 90-2. PubLg: French. Cat: syntax. Basset, Andre. 1948f. Sur la toponymie berbere et specialement sur la toponymie Chaouia Ait Frah. In Onomastica, 123-6. PubLg: French. Cat: toponomy, Chaouia, Ait Frah, Algeria. Basset, Andre. 1949a. Cartes usuelles et cartes scientifiques. In IIIe Congr. Intern. Topon. Antrhopon., 457-9. PubLg: French. Cat: dialect geography. Basset, Andre. 1949b. Sur une notation berbere de G. F. Lyons. In Annali, Istituto Universitario Orientale, Sezione Linguistica, 379-81. PubLg: French. Cat: sample texts. Basset, Andre. 1949c. Sur le participe berbere. Comptes rendus du Groupe Linguistique d’Etudes Chamito-Semitiques 5: 34-6. PubLg: French. Cat: morphology. Basset, Andre. 1949d. Sur une singularite des parler berberes du sud marocain. In Comptes rendus du Groupe Linguistique d’Etudes Chamito-Semitiques, 29-31. PubLg: French. Cat: dialect geography, Morocco. Basset, Andre. 1950a. Les parlers berberes. In Initiation a Tunisie, 220-6. Paris. PubLg: French. Cat: Berber language, Tunisia. Basset, Andre. 1950b. Reduction de diphtongue et constance de la voyelle initiale en berbere. Comptes rendus du Groupe Linguistique d’Etudes Chamito-Semitiques 5: 51-2. PubLg: French. Cat: phonology. Basset, Andre. 1950c. Sur l’anticipation en berbere. In Melanges William Marcais, 17-27. Paris. PubLg: French. Cat: syntax, morphology. Basset, Ander. 1950d. Sur une confusion de verbes dans le dictionnaire du P. de Foucauld. Travaux de l’Institut des Recherches sahariennes 6: 3-7. PubLg: French. Cat: glossary, Tuareg. Basset, Andre. 1951a. Determination et indetermination du nom en berbere. Comptes rendus du Groupe Linguistique d’Etudes Chamito-Semitiques 5: 95-6. PubLg: French. Cat: morphology. Basset, Andre. 1951b. Sur un theme berbere d’aoriste intensif insolite. Comptes rendus du Groupe Linguistique d’Etudes Chamito-Semitiques 6: 2. PubLg: French. Cat: morphology. Basset, Andre. 1952a. Le langue berbere. Handbook of African Languages, Part 1. Oxford: Oxford UP. PubLg: French. Cat: phonology, morphology, syntax, glossary, writing system, bibliography. Basset, Andre. 1952b. La place du dictionnaire touareg-francais du P. de Foucauld dans les etudes berberes. In Journal Asiatique, 548. PubLg: French. Cat: glossary, Tuareg. Basset, Andre. 1952c. Sur l’evolution actuelle du preterit negatif en berbere. Comptes rendus du Groupe Linguistique d’Etudes Chamito-Semitiques 6: 25-6. PubLg: French. Cat: morphology. Basset, Andre. 1952d. Sur la metrique berbere. In C. r. somm. Insitut Francais d’anthropologie, 4-5. Paris. PubLg: French. Cat: poetry, prosody, Tuareg. Basset, Andre. 1953. Noms de parente en berbere. Comptes rendus du Groupe Linguistique d’Etudes Chamito-Semitiques 6: 27-30. PubLg: French. Cat: lexicography. Basset, Andre. 1954a. ‘maintenant’ en berbere. Bulletin de la Societe d’Archeologie Copte 50: 221-30. PubLg: French. Cat: lexicography. Basset, Andre. 1954b. ‘n’ devant complement de nom en berbere. Comptes rendus du Groupe Linguistique d’Etudes Chamito-Semitiques 7: 1-5. PubLg: French. Cat: morphology. Basset, Andre. 1954c. Sur berbere Ait Sadden it(t)h ‘parce que’ et la formation du systeme conjonctif. Comptes rendus du Groupe Linguistique d’Etudes Chamito-Semitiques 6: 64. PubLg: French. Cat: morphology, Ait Sadden. Basset, Andre. 1954d. Sur le participe dans le parler berbere d’Ait Sadden. In Journal Asiatique, 393-6. PubLg: French. Cat: morphology, Ait Sadden. Basset, Andre. 1955a. ‘Apres midi’ en berbere. Bulletin de la Societe d’Archeologie Copte 50: 181-7. PubLg: French. Cat: lexicography. Basset, Andre. 1955b. Notules berberes Ait Sadden. Comptes rendus du Groupe Linguistique d’Etudes Chamito-Semitiques 1-3. PubLg: French. Cat: Berber language, Ait Sadden. Basset, Andre. 1955c. Sur le verbe berbere signifiant "vivre." In Afrikanistische Studien Diedrich Westermann zum 80. Geburtstag gewidmet, 15-50. PubLg: French. Cat: dialect geography, lexicography. Basset, Andre. 1959. 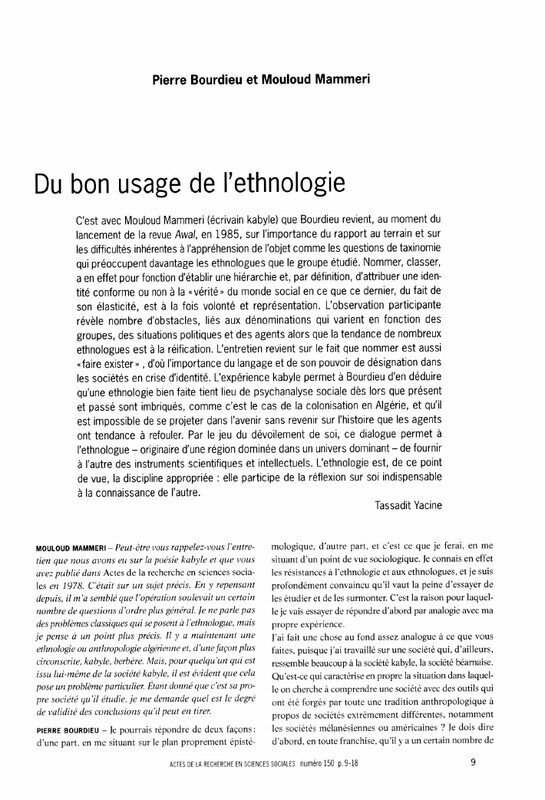 Articles de dialectologie berbere. Paris: Klincksieck. PubLg: French. Cat: Berber language, bibliography. Basset, Andre. 1961. Textes berberes de l’Aures. Paris. PubLg: French. Cat: sample texts, Aures. Basset, Andre. 1969. La langue berbere. London: Dawsons. PubLg: French. Cat: Berber language, bibliography. Basset, Andre and J. Crouzet. 1937. Cours de berbere. Algiers. PubLg: French. Cat: textbook, Kabyle. Basset, Andre and Andre Picard. 1948. Elements de grammaire berbere (kabylie-Irjen). Algiers: "La Typo-Litho" and Jules Carbonel. PubLg: French. Cat: grammar, Kabyle, Irjen. Basset, Andre and Andre Picard. 1949. Sur berbere YIR ‘mauvais’ chez les Irjen. Revue africaine 93: 291-313. PubLg: French. Cat: lexicography, Irjen, Kabyle. Basset, Henri. 1917. Rapport sur une mission chez les Ntifa. Les Archives berberes 2: 97-122. PubLg: French. Cat: ethnography, Ntifa, Berber language. Basset, Henri. 1918. Les elements du peuple marocain. France-Maroc 2: 261-7. PubLg: French. Cat: ethnography, Morocco, Berber language. Basset, Henri. 1921a. Les influences Puniques chez les Berberes. Revue africaine 62: 340-74. PubLg: French. Cat: Berber history. Basset, Henri. 1921b. Quelques nouveaux contes berberes. Rev. ethnog. 2: 26-38. PubLg: French. Cat: sample texts. Basset, Henri. 1922. Les proverbes de l’Ahaggar. Revue africaine 43: 389-502. PubLg: French. Cat: sample texts, Ahaggar, Tuareg. Basset, Henri. 1923. Un nouveau manuscrit berbere: le Kitab elmawaiza. Journal Asiatique 202: 299-303. PubLg: French. Cat: manuscripts, Kitab. Basset, Henri. 1925. La population berbere: Origines, Langue, Moeurs, Religion. In Armee d’Afrique, 13-21. Paris. PubLg: French. Cat: ethnography, Berber history, Berber language. Basset, Rene. 1879. Poeme de Cabi en dialecte Chelha. Journal Asiatique 7/13: 476-508. PubLg: French. Cat: poetry, Cabi, Tashlhiyt, sample texts. Basset, Rene. 1883a. Injil ne Sidna Aisa l’Masih’ akken itsouaktheb sarresoul Mattieu. Algiers. PubLg: Kabyle. Cat: sample texts, Kabyle, translation of Matthew’s Gospel into Kabyle. Basset, Rene. 1883b. Notes de lexicographie berbere. Journal Asiatique 8/1: 281-342. PubLg: French. Cat: lexicography, Rifian, Djerba, Ghat, Kel Qui, sample texts, grammar. Basset, Rene. 1883c. Relation de Sidi Brahim de Massat. Paris. PubLg: French. Cat: sample texts, Sidi Brahim, Massat, Tashlhiyt. Basset, Rene. 1884. Notes de lexicographie berbere. Journal Asiatique 8/4: 518-56. PubLg: French. Cat: lexicography, Algeria, sample texts, grammar. Basset, Rene. 1885a. Notes de lexicographie berbere. Journal Asiatique 8/5: 148-219. PubLg: French. Cat: lexicography, Beni Menacer, sample texts, grammar. Basset, Rene. 1885b. Notes de lexicographie berbere. Journal Asiatique 8/6: 302-71. PubLg: French. Cat: lexicography, Oran, sample texts, grammar. Basset, Rene. 1885c. Salomon et le dragon. Bulletin de correspondance africaine 2: 3-4. Paris: Leroux. PubLg: French. Cat: sample texts, Kabyle. Basset, Rene. 1886. Notes de lexicographie berbere. Journal Asiatique, ser 8, vol 7. PubLg: French. Cat: lexicography, Figuig, sample texts, grammar. Basset, Rene. 1887a. Contes populaires Berberes. Collection de contes et de chansons populaires, vol. 12. Paris. PubLg: French. Cat: sample texts. Basset, Rene. 1887b. Le dialecte berbere de Taroundant. Giornale della Societa Asiatica Italiana 8: 1-63. PubLg: French. Cat: Berber language, Taroundant, Tashlhiyt. Basset, Rene. 1887c. Manuel de langue kabyle. Paris. PubLg: French. Cat: textbook, Kabyle, grammar, sample texts, glossary. Basset, Rene. 1887d. Notes de lexicographie berbere. Journal Asiatique 8/10: 365-464. PubLg: French. Cat: lexicography, Gourara, Mzab, Tuareg, sample texts, grammar. Basset, Rene. 1887e. Recueil de textes et documents relatifs a la philologie berbere. Algiers. PubLg: French. Cat: sample texts, Beni-Menacer, Oran, Figuig, Oued Draa, Tashlhiyt. Basset, Rene. 1890a. Le Dialecte de Syouah. Bulletin de correspondance africaine 5. Paris: Leroux. PubLg: French. Cat: Berber language, Siwa, grammar. Basset, Rene. 1890b. Les dictons satiriques sur les villes et les tribus d’Algerie attribuees a Sidi Ah’med ben Yousof. PubLg: French. Cat: Arabic texts, Algeria, Sidi Ah’med ben Yousof, toponymy. Basset, Rene. 1890c. Loqman berbere. Paris. PubLg: French. Cat: sample texts, Arabic, bibliography, comparative linguisitcs, glossary. Basset, Rene. 1891. L’Insurrection algerienne de 1871 dans les chansons populaires Kabyles. Le Museon 11: 254-70, 330-51, 428-34. PubLg: French. Cat: songs, sample texts, Berber history. Basset, Rene. 1892a. Notice sur le dialectes berberes des Haratka et du Djerid Tunisien. Publ. IX Congr. Intern. Orient., vol. 2. PubLg: French. Cat: Berber language, Haratka, Tunisia. Basset, Rene. 1892b. Textes berberes dans le dialecte des Beni Menacer. Giornale della Societa Asiatica Italiana 6: 37-84. PubLg: French. Cat: sample texts, Beni Menacer, Algieria, glossary. Basset, Rene. 1893a. Etude sur la Zenatia du Mzab, d’Ouargla, et de l’Oued-Rir’. Bulletin de correspondance africaine 12. Paris: Leroux. PubLg: French. Cat: comparative linguistics, Zenatia, Mzab, Ouargla, the Oued-Rir’, historical linguistics, grammar, sample texts, Algeria. Basset, Rene. 1893b. Index des principales racines des mots berberes. Le Museon 12: 5-16. PubLg: French. Cat: morphology, historical linguistics, comparative linguistics. Basset, Rene. 1893c. Rapport sur les etudes berberes, arabes et Ethiopiennes 1887-1891. Publ. IX Congr. Intern. Orient. Paris. PubLg: French. Cat: Berber language, bibliography. Basset, Rene. 1894. Etudes sur les dialectes berberes. Bulletin de correspondance africaine 14. Paris: Leroux. PubLg: French. Cat: comparative linguistics, phonology, morphology, historical linguistics, bibliography. Basset, Rene. 1895a. Etude sur la Zenatia de l’Ouarsenis et du Maghreb Central. Bulletin de correspondance africaine 15. Paris: Leroux. PubLg: French. Cat: comparative linguistics, Zenatia, Ouarsenis, the Central Maghreb historical linguistics, grammar, sample texts, glossary, Algeria, Morocco. Basset, Rene. 1895b. Les noms de metaux et des couleurs en berbere. Memoires, Societe de Linguistique de Paris 9: 58-92. PubLg: French. Cat: lexicography, comparative linguistics, morphology, Basque. Basset, Rene. 1896. Notes sur le chaouia de la province de Constantine. Journal Asiatique 9/8: 361-94. PubLg: French. Cat: Berber language, Chaouia. Basset, Rene. 1897a. Etude sur les dialectes berberes du Rif marocain. In Act. XI Congr. Intern. Orient., sec. 5, 71-171. PubLg: French. Cat: comparative linguistics, Rifian, Temsaman, Beni Ouriaghel, Ibeqqoyen. Basset, Rene. 1897b. Nouveaux contes berberes. Collection de contes et chansons populaires, vol. 23. Paris. PubLg: French. Cat: sample texts. Basset, Rene. 1898. Notice sur le dialecte berbere des Beni-Iznacen. Giornale della Societa Asiatica Italiana 11: 1-14. PubLg: French. Cat: Berber language, Rifian. Basset, Rene. 1899a. Les noms berberes des plantes dans le Traite des simples d’Ibn el Beiter. Giornale della Societa Asiatica Italiana 12: 53-66. PubLg: French. Cat: lexicography. Basset, Rene. 1899b. Rapport sur les langues africaines 1891-1897. Act. XI Congr. Intern. Orient 5: 53-70. PubLg: French. Cat: Berber language, bibliography. Basset, Rene. 1899c. Rapport sur les langues berberes et haoussa 1891-1897. Act. XI Congr. Intern. Orient 5: 39-51. PubLg: French. Cat: Berber language, bibliography. Basset, Rene. 1901. Nedromah et les Traras. Bulletin de correspondance africaine 24. Paris: Leroux. PubLg: French. Cat: Berber history, glossary. Basset, Rene. 1902. Rapport sur les etudes berberes et haoussa 1897-1902. Journal Asiatique 9/20: 307-25. PubLg: French. Cat: Berber language, bibliography. Basset, Rene. 1903. Contes populaires d’Afrique. Les litteratures populaires de toutes les nations. Paris. PubLg: French. Cat: texts. Basset, Rene. 1905. Le nom de chameau chez les Berberes. In Act. Congr. Intern. Orient., 69-82. PubLg: French. Cat: lexicography. Basset, Rene. 1906. Les mots arabes passes en berbere. Orientalische Studien Thodor Noldeke Gewidment 1: 439-43. PubLg: French. Cat: lexicography, comparative linguistics, Arabic, morphology. Basset, Rene. 1908. Rapport sur les etudes berberes et haoussa 1902-1908. Revue africaine 52: 243-64. PubLg: French. Cat: Berber language, bibliography. Basset, Rene. 1909. Mission au Senegal. Bulletin de correspondance africaine 39. Paris: Leroux. PubLg: French. Cat: Berber language, Zenaga. Basset, Rene. 1910. Recherches sur la religion des Berbers. Rev. Hist. relig. 61: 291-342. PubLg: French. Cat: ethnography, Berber language. Basset, Rene. 1915. Melanges africains et orientaux. Paris. PubLg: French. Cat: Berber languages, collection of articles, those dealing with Berber mentioned separately in bibliography. Basset, Rene. 1919. Rapport sur les etudes relatives a la linguistique berbere 1913-1918. Revue africaine 60: 161-9. PubLg: French. Cat: historical linguistics. Basset, Rene. 1922. Textes touaregs en prose. Algiers. PubLg: French. Cat: sample texts, Tuareg. Basset, Rene, and G. Yver. 1908. Berberes. Encyclopedia of Islam. PubLg: French. Cat: ethnography, Berber language. Bauer Landauer, Ignacio. 1921. El Rif y la Kabila de Beni Urriaguel. Memorias, Sociedad espanola de antropologia, etnografia y prehistoria 1: 3-13. PubLg: Spanish. Cat: ethnography, Rifian, Kabyle, Beni Urriaguel, Berber language. Begouen, Henri. 1932. De quelques poetes du Hoggar et de la poesie des Touaregs d’apres le Pere de Foucauld. In Mem. Acad. sci. inscr. bell. let. Toul., 203-34. PubLg: French. Cat: poetry, Hoggar, Tuareg. Beguinot, Francesco. No date a. Le gente libiche. In L’Impero Coloniale Fascista, 375-400. PubLg: Italian. Cat: ethnography, Libya, Berber language. Beguinot, Francesco. No date b. Gli studi berberi dal 1919 al maggio 1922. Rivista degli Studi Orientali 9: 382. PubLg: Italian. Cat: Berber language, bibliography. Beguinot, Francesco. 1914. L’area linguistica berbera. Rome: Ministero delle Colonie. PubLg: Italian. Cat: dialect geography, maps. Beguinot, Francesco. 1917-8. Il gergo dei Berberi della Tripolitania. In Annuar. Ist. Orient. Nap. PubLg: Italian. Cat: Berber language, Tripolitania. Beguinot, Francesco. 1924a. A proposito di una voce libica citata da Erodoto. Africa italiana, vol. 3. PubLg: Italian. Cat: comparative linguistics, historical linguistics, etymology. Beguinot, Francesco. 1924b. Sul trattamento delle consonanti b, v, f in berbero. Riv. Accademia dei Lincei 33: 186-99. PubLg: Italian. Cat: phonology. Beguinot, Francesco. 1925. Saggio di fonetica del Berbero Nefusi di Fassato. Rc. Accademia dei Lincei, ser. 6, vol. 1, no. 6. PubLg: Italian. Cat: phonology, phonetics, Nefusa, Fassato. Beguinot, Francesco. 1927. Appunti di epigrafia libica. Africa italiana 6: 127-35. PubLg: Italian. Cat: orthography, Libyan, Tuareg. Beguinot, Francesco. 1928. Sugli ‘Atapartesi di Erodoto e sul nome berbero del grande Atlante. Memorial Henri Basset 1: 29-42. Paris. PubLg: French. Cat: historical linguistics, bibliography. Beguinot, Francesco. 1929. Note di epigrafia libica. Analli, Istituto Universitario Orientale, Sezione Linguistica. PubLg: Italian. Cat: orthography, Libyan. Beguinot, Francesco. 1930. Per gli studi di toponomastica libico berbera. Att. XI Congr. Geogr. Ital. 3: 243-7. Naples. PubLg: Italian. Cat: toponymy, Libya. Beguinot, Francesco. 1931a. Il berbere Nefusi di Fassato. Rome. PubLg: Italian. Cat: grammar, Nefusa, Fassato, Libya, phonology, morphology, syntax, sample texts, glossary. Beguinot, Francesco. 1931b. Gli studi di linguistica berbera. Att. 1° Congr. stud. col. Florence. PubLg: Italian. Cat: historical linguistics. Beguinot, Francesco. 1931c. Gli studi di linguistica berbera. La Rivista Orienta 4: 137-47. PubLg: Italian. Cat: historical linguistics. Beguinot, Francesco. 1931d. Proposition en vue d’editer un dictionnaire compare des dialectes de la langue berbere. Paris: International Institute of African Languages and Cultures. PubLg: French. Cat: glossary, comparative linguistics, dialect geography. Beguinot, Francesco. 1932. Le iscrizioni rupestri in caraterri tifinagh. In Att. 2° Congr. stud. col., 104-12. Naples. PubLg: Italian. Cat: inscriptions, orthography, Tifinigh, Tuareg. Beguinot, Francesco. 1932-3. I berberi e le recenti scoperte nel Fezzan. Africa italiana 197-208. PubLg: Italian. Cat: Berber history. Beguinot, Francesco. 1934. Gli studi di linguistica berbera. In La Rivista Orienta, 145-8. PubLg: Italian. Cat: historical linguistics. Beguinot, Francesco. 1935a. Le iscrizioni berbere del Sahara. In La Rivista d’Orienta, 59-62. PubLg: Italian. Cat: inscriptions, orthography, Sahara. Beguinot, Francesco. 1935b. Studi linguistici nel Fezzan. Bollettino, Societa geografica italiana 6/12: 660-5. PubLg: Italinan. Cat: historical linguistics, the Fezzan. Beguinot, Francesco. 1938. Di alcune parole dellinguaggi nord-africani derivate del latino. Rome. PubLg: Italian. Cat: historical linguistics. Beguinot, Francesco. 1939. L’unita linguistica semito-camitica. Annuario, R. Accademia d’Italia 1: 139-44. PubLg: Italian. Cat: historical linguistics. Beguinot, Francesco. 1943. Alcune etimologie e questioni fonetische Magrebine. Analli, Istituto Universitario Orientale, Sezione Linguistica 2. PubLg: Italian. Cat: historical linguistics, etymology, phonetics, comparative linguistics. Beguinot, Francesco. 1949. Di alcune inscrizioni in caratteri latini e in lingua sconoscuta trovate in Tripolitania. Rivista degli Studi Orientali 24: 14-19. PubLg: Italian. Cat: orthography, Libyan. Beguinot, Francesco. 1953. Gli studi sull’epigrafia libica e sulle iscrizione Tuareg in Italianell’ ultimo quarentennio. Libia 1: 82-90. PubLg: Italian. Cat: orthography, Libyan, Tuareg, bibliography. Belkassem ben Sedira. 1887a. Cours de langue Kabyle. Algiers. PubLg: French. Cat: textbook, Kabyle, grammar. Belkassem ben Sedira. 1887b. Une mission en Kabylie sur les dialectes berberes et l’assimilation des indigenes. Algiers. PubLg: French. Cat: ethnography, Kabyle, Berber langauge. Benhazera, Maurice and Pelekus. 1933. Les Touaregs, les Tifinars berberes et l’origine de l’ecriture. Atlantis 6: 129-44. PubLg: French. Cat: orthography, Tuareg, Tifinigh. Benoit, Fernand. 1930. Recherches sur les berberophones. Act. XV Congr. Intern. Anthro. Archeol. Preh. Coimbra. PubLg: French. Cat: Berber language, Djerba, Ahaggar, Morocco. Bentolila, Fernand. 1969. Les modalites d’orientation du proces en berbere. La Linguistique 1: 85-96; 2: 91-111. PubLg: French. Cat: morphology. Bentolila, Fernand. 1979. Les valeurs modales en berbere (parler des Ait Seghrouchen d’Oum Jeniba, Maroc central). In Linguistique Fonctionnelle, 191-202. Mahmoudian, M. (ed.). Paris: PUF. PubLg: French. Cat: morphology, Ait Seghrouchen, Oum Jeniba, Morocco. Bentolila, Fernand. 1981. Grammaire fonctionnelle d'un parler berbere, ait seghrouch en d'oum jeniba (maroc). Paris: Societe d’Etudes Linguistiques et Anthropologiques de France. PubLg: French. Cat: grammar, Ait Seghrouch, Oum Jeniba, Morocco. Bentolila, Fernand. 1991. La Possession en berbere. Modeles Linguistiques 13/1(25): 25-30. PubLg: French (with English summary). Cat: syntax, possessive construction. Bernard, Augustin. 1921. Enquete sur l’habitation rurale des indigenes de l’Algerie. Algiers. PubLg: French. Cat: ethnography, Algeria, Kabyle. Bernard, Augustin, and Paul Moussard. 1924. Arabophones et Berberophones au Maroc. Annis. Geogr. 33: 267-82. PubLg: French. Cat: dialect geography, Arabic, Morocco. Bernard, J. M. 1893. La langue Maure. Paris. PubLg: French. Cat: Berber Language, Mauritania, Senegal. Berque, J. 1950. Un glossaire notarial arabo-chleu du Deren. Revue africaine 94: 357-98. PubLg: French. Cat: glossary, Arabic, Chleu, Deren. Berthelot, Sabin. 1897. Antiquities Canariennes. Paris. PubLg: French. Cat: Berber history. Berthelot, Sabin and Webb. 1842. Histoire Naturelle des Iles Canaries. Paris. PubLg: French. Cat: Berber history. Bertholon, Lucien J. 1903-6. Origine et formation de la langue berbere. Revue tunisienne. PubLg: French. Cat: historical linguistics. Bertholon, Lucien J. 1905. Note sur les noms des Iberes, Berberes, et Africains. Bulletin, Societe d’anthropologie de Paris 6: 145-9. PubLg: French. Cat: lexicography, comparative linguistics, Spanish, African. Beurmann, Carl Moritz von. 1862. Brief des Herrn von Beurmann an Prof. Fleischer. Zeitschrift der Deutschen Morgenlandischen Gesellschaft 16: 563-5. PubLg: French. Cat: lexicography, Augila. Biarnay, S. 1908. Etude sur le dialecte berbere de Ouargla. Bulletin de correspondance africaine 37. Paris: Leroux. PubLg: French. Cat: phononogy, morphology, syntax, glossary, sample texts. Biarnay, S. 1911a. Etude sur le dialecte des Bet’t’ioua du Vieil-Arzeu. Algiers. PubLg: French. Cat: Berber language, Rifian, sample texts, glossary, Ait-Saaden, Beni-Mgild, Morocco. Biarnay, S. 1911b. Notice sur les dialectes berberes parles par les Aith-Sadden et les Beni-Mgild. Revue africaine, vol. 55. PubLg: French. Cat: Berber language, Ait-Saaden, Beni-Mgild. Biarnay, S. 1912. Six textes en dialecte berbere des Beraber de Dades. Journal Asiatique 10/19: 346-71. PubLg: French. Cat: sample texts, Beraber, Dades, Morocco. Biarnay, S. 1915. Notes sur les chants populaires du Rif. Les Archives Berberes 1: 22-39. PubLg: songs, Rifian, sample texts. Biarnay, S. 1917. Etude sur les dialectes berberes du Rif. Bulletin de correspondance africaine 54. Paris: Leroux. PubLg: French. Cat: phonology, Rifian, sample texts, glossary, comparative phonology. Biarnay, S. 1924. Notes d’ethnographie et de linguistique nord-africaines. Brunot, Louis and Emile Laoust (eds.). (Pub.) l’Institut des Hautes Etudes Marocaines 12. Paris. PubLg: French. Cat: ethnography, Mzabi, sample texts, glossary. Bisson, Paul. 1940. Lecons de berbere tamazight. Rabat. PubLg: French. Cat: textbook, Tamazight, Morocco. Blaudin de The, Bernard. 1959. Essai de Bibliographie du Sahara Francais et des regions avoisinantes. Service des Affaires sahariennes. PubLg: French. Cat: bibliography, Sahara, many ommissions and inaccuracies. Boissontet, E. c. 1880. Le k’lem tifinag. Paris: Challamel. PubLg: French. Cat: orthography, Tifinigh, Tuareg. Bomhard, - and - Kern. 1994. No title. In The Nostratic Macrofamily, 25. The Hague? : Mouton de Gruyter. PubLg: English. Cat: comparative linguistics, Nostratic macrofamily. Bossoutrot, A. 1900. Vocabulaire berbere ancien. Revue tunisienne 7: 489-507. PubLg: French. Cat: lexicography, Jebel Nefusi. Bottiglieri, R. 1936. Studi italiani sull’epigrafia libica e sulle iscrizioni tifinagh. Africa italiana 54: 367-77. PubLg: Italian. Cat: orthography, Libyan, Tuareg. Boukous, Ahmed. 1979a. La formation du glide en tamazight (dialecte tachelhit). Traces 2: 3-41. PubLg: French. Cat: phonology, glides, Tamazight, Tashlhiyt. Boukous, Ahmed. 1979b. La Situation linguistique au Maroc: Competition symbolique et acculturation. Revue Litteraire Mensuelle 602-603: 5-21. PubLg: French. Cat: ethnography, sociolinguistics, Morocco. Boukous, Ahmed. 1982. Les contraintes de structure segmentals en berbere (dialecte tachelhit). Langues et Litteratures 2: 9-27. PubLg: French. Cat: phonology, morphology, morphophonology, Tashlhiyt. Boukous, Ahmed. 1987a. Phonotactique et domaines prosodiques en berbere (parler tachelhit d’Agadir). These de Doctorat d’etat. Vincennes a Saint-Denis: University de Paris VIII. PubLg: French. Cat: phonology, prosody, Tashlhiyt, Agadir. Boukous, Ahmed. 1987b. Syllabe et syllabation en berbere. Awal: Cahiers d’Etudes Berberes 3. Paris: Maison des Sciences de l’Homme. PubLg: French. Cat: phonology, syllabification. Boukous, Ahmed. 1989. Approches de la syllabe en tamazight. In Lange et Societe au Maghreb, Bilan et Perspectives. Rabat: Publications de la Faculte des Lettres. PubLg: French. Cat: phonology, syllabification, Tamazight, North Africa. Boukous, Ahmed. 1990. Pharyngalisation et domaines prosodiques. Etudes et Documents Berberes 7: 68-91. PubLg: French. Cat: phonology, prosody, pharyngalization. Boukous, Ahmed. 1995a. La Langue berbere: Maintien et changement. International Journal of the Sociology of Language 112: 9-28. PubLg: French. Cat: sociolinguistics, comparison to Modern Arabic, comparison to Modern French. Boukous, Ahmed. 1995b. Societe, langues et culture au Maroc: Enjeux symboliques. Rabat: Publications de la Faculte des Lettres. PubLg: French. Cat: sociolinguistics, Morocco. Boukous, Ahmed. 1996. Language Shift and Language Maintenance: The Case of Berber in Morocco. Workshop handout, UMass. PubLg: English. Cat: sociolinguistics, Morocco. Boukous, Ahmed. 1997. Situation sociolinguistic de l’amazighe. International Journal of the Sociology of Language 123: 41-60. PubLg: French. Cat: sociolinguistics, comparison to Moroccan Arabic. Boulifa, Si Ammar ben Said. 1904. Recueil de poesies kabyles. Algiers. PubLg: French. Cat: poetry, Kabyle, sample texts, metrics, Arabic. Boulifa, Si Ammar ben Said. 1905a. Le Kanoun d’Ad’ni. Memoires et textes, XIV Congr. Intern. Orient. Algiers. PubLg: French. Cat: sample texts, Kanoun, Ad’ni. Boulifa, Si Ammar ben Said. 1905b. Manuscrits berberes du Maroc. Journal Asiatique 10/6: 333-62. PubLg: French. Cat: manuscripts, Morocco. Boulifa, Si Ammar ben Said. 1908. Textes berberes en dialecte de l’Atlas Marocain. Bulletin de correspondance africaine 36. Paris: Leroux. PubLg: French. Cat: sample texts, Atlas, Morocco. Boulifa, Si Ammar ben Said. 1909. L’inscription d’Ifir’a. Revue Archeologique 53: 411. PubLg: French. Cat: inscriptions, orthography, Ifir’a, Algeria. Boulifa, Si Ammar ben Said. 1911. Noveaux documents archeologiques decouverts dans le Haut Sebaou. Revue africaine 55: 16-41. PubLg: French. Cat: inscriptions, orthography, Haut Sebaou, Kabyle, Tuareg, Tifinigh. Boulifa, Si Ammar ben Said. 1913a. Une premiere annee de langue Kabyle. Algiers. PubLg: French. Cat: textbook, Kabyle, sample texts, glossary. Boulifa, Si Ammar ben Said. 1913b. Etude linguistique et sociologique sur la Kabylie de Djurdjura. Algiers. PubLg: French. Cat: historical linguistics, Kabyle, Djurdjura. Boulifa, Si Ammar ben Said. 1913c. Methode de langue Kabyle. Algiers. PubLg: French. Cat: textbook, Kabyle, sample texts, glossary. Bourilly, J. 1932. Elements d’ethnographie marocaine. Laoust, Emile (ed.). Paris. PubLg: French. Cat: ethnography, Morocco, Berber language, bibliography, glossary, Arabic. Bousquet, Georges H. 1957. Les Berberes. Paris. PubLg: French. Cat: Berber history, bibliography. Boutemene, Y. 1942. A propos des noms du fouet en touareg. Bulletin des etudes arabes 8: 73-4. PubLg: French. Cat: lexicography, Tuareg. Boutkan, D. and M. G. Kossman. 1999. Some Berber Parallels of European Substratum Words. Journal of Indo European Studies 27:1-2, 87-100. PubLg: English. Cat: comparative linguistics, glossary. Bouveret, -. Chansons marocianes du Sud. In Maroc Medical, 142-4, 202-4, 452. PubLg: French. Cat: songs, Morocco. Brinton, Daniel G. 1894. The alphabets of the Berbers. Proc. Orient. Clb. Phila. Philadelphia. PubLg: English. Cat: orthography. Brockelmann, Carl. 1906. Semitische Sprachwissenschaft. Leipzig. PubLg: German. Cat: historical linguistics. Brockelmann, Carl. 1932. Gibt es einen hamitschen Sprachstamm? Anthropos 27: 797-818. PubLg: German. Cat: historical linguistics. Bronzi, Pietro. 1919. Frammento di fonologia berbera. Bologne. PubLg: Italian. Cat: phonology. Brosselard, Charles. 1882. Lettre a M. E. Renan. Journal Asiatique 7/19: 518-21. PubLg: French. Cat: Berber language. Brosselard, Charles, et al. 1844. Dictionnarie francais-berbere. PubLg: French. Cat: glossary, Kabyle. Broussais, Emile. 1883. Recherches sur les transformations du berbere. Bulletin de correspondance africaine 1. Paris: Leroux. PubLg: French. Cat: historical linguistics. Browman, C., L. Goldstein, A. Jebbour, and E. Selkirk. 1996. An articulatory study of Berber syllabification. Lecture notes. PubLg: English. Cat: phonology, articulatory phonology, syllabification, Tashlhiyt, Imdlawn, Morocco. Brugnatelli, Vermondo. 1986. Alternaze accentuali e morfo sintassi nominale nel berbero orientale; Ist. di Glottologia e Lingue Orientali, Univ. degli Studi di Milano, Fac. di Lett. e Filos. In Contributi di orientalistica, glottologia e dialettologia. Milan: Cisalpino Goliardica, 61-72. PubLg: Italian. Cat: morphology, syntax, nouns, relationship to stress. Brugnatelli, Vermondo. 1987. Deux notes sur l’etat d’annexion en berbere. In Proceedings of the Fourth International Hamito Semitic Congress: Marburg, 20-22 September, 1983, 381-394. Jungraithmayr, Hermann and Walter W. Muller (eds.). Amsterdam: Benjamins. PubLg: French. Cat: phonetics, phonetic annexation. Brunot, Louis. No date. L’elaboration du questionnaire destine a l’establissement de l’atlas linguistique du Maroc. Hesperis, vol. 19. PubLg: French. Cat: dialect geography, Morocco. Brunot, Louis. 1920. Notes lexicologiques sur le vocabulaire maritime de Rabat et Sale. Publications de l’Institut des Hautes Etudes Marocaines 6. Paris. PubLg: French. Cat: lexicography, Rabat, Sale. Brunot, Louis. 1923. Noms de vetements masculins a Rabat. Melanges Rene Basset. Paris. PubLg: French. Cat: lexicography, Rabat. Brunot, Louis. 1930. Topographie dialectale de Rabat. Hesperis 10: 7-13. PubLg: French. Cat: dialect geography, Rabat. Burton, D. G. 1893. The alphabets of the Berbers. Science 21: 104. PubLg: English. Cat: orthography. Buselli, G. 1921. Testi berberi del Gebel Nefusa. Africa italiana 50: 26-34. PubLg: Italian. Cat: sample texts, Jebel Nefusi, Gemmari. Buselli, G. 1924. Berber Texts from Jebel Nefusi. Jl. R. Afr. Soc. 23: 285-93. PubLg: English. Cat: sample texts, Jebel Nefusi. Bute, John (Marquess of). 1891. On the ancient language of the natives of Tenerife. London. PubLg: English. Cat: comparative linguistics, Canary Islands. Bynon, James. 1966. Riddle Telling among the Berbers of Central Morocco. African Language Studies 7: 80-104. PubLg: English. Cat: Berber languages. Bynon, James. 1969. Berber Nursery Language. Transactions of the Philological Society, Oxford OX2 6UD: 107-61. PubLg: English. Cat: paralinguistics, psycholinguistics, development of language. Bynon, James. 1970. The Contribution of Linguistics to History in the Field of Berber Studies. In Language and History in Africa, 64-77. Dalby, David (ed.). New York: Africana Pub. Corp. PubLg: English. Cat: paralinguistics. Bynon, James. 1977. The Derivational Processes Relating Berber Nursery Words to Their Counterparts in Normal Inter-Adult Speech. In Talking to Children: Language Input and Acquisition, 255-69. Snow, Catherine E. and Charles A. Ferguson (eds.). Cambridge: Cambridge UP. PubLg: English. Cat: psycholinguistics, development of language. Bynon, James. 1978. The Internal Reconstruction of Berber Vowels and Semivowels. In Atti del secondo congresso internazionale di linguistica camito semitica, Firenze, 16-19 aprile 1974, 293-299. Fronzaroli, Pelio (ed.). Florence: Inst. Di Ling. e di Lingue Orientali. PubLg: English. Cat: phonology, vowels, semivowels, internal reconstruction. Bynon, James. 1979. The Baby Talk Register and Diachrony: The Evidence from Arabic and Berber. International Conference on Historical Linguistics. ?:? PubLg: English. Cat: historical linguistics, psycholinguistics, development of language, Arabic. Cadi, Kaddour. 1997. Constance et variabilite syntaxiques interdialectales en berbere. International Journal of the Sociology of Language 123: 147-62. PubLg: French (with English summary). Cat: syntax, dialects. Cailliaud, Frederic. 1826-7. Voyage a Meroc, au Fleuve Blanc, au dela de Fazoql dans le midi du Royaume de Sennaar, a Syouah et dans cinq autres Oasis, fait dans les annees 1819-20-21 et 22. Paris. PubLg: French. Cat: Berber language, Siwa, glossary. Caillie, Rene. 1830. Journal d’un voyage a Tembouctou et a Jenne dans l’Afrique centrale pendant les annees 1824-25-26-27-28. Paris. PubLg: French. Cat: Berber language. Calassanti-Motylinski, G. A. de. 1885a. Chanson berbere de Djerba. Bulletin de correspondance africaine 5-6: 461-4. Paris: Leroux. PubLg: French. Cat: songs, Djerba, Tunisia. Calassanti-Motylinski, G. A. de. 1885b. Le Djebel Nefousa: Ir’asra d Ibridn di drar n Infousen. Algiers. PubLg: French. Cat: sample texts, Jebel Nefusi. Calassanti-Motylinski, G. A. de. 1885c. Les livres de la secte abadhite. Algiers. PubLg: French. Cat: manuscripts, Abadhit sect, Arabic, Mzab, Nefusi, Berber history, bibliography, toponymy. Calassanti-Motylinski, G. A. de. 1897. Dialogue et textes en berbere de Djerba. Journal Asiatique 9/10: 377-401. PubLg: French. Cat: sample texts, Djerba. Calassanti-Motylinski, G. A. de. 1898. Le Djebel Nefousa. Bulletin de correspondance africaine 22. Paris: Leroux. PubLg: French. Cat: Berber language, Djebel Nefousa, sample texts, grammar. Calassanti-Motylinski, G. A. de. 1904. Le Dialecte Berbere de R’edames. Bulletin de correspondance africaine 28. Paris: Leroux. PubLg: French. Cat: Berber language, R’edames, Libyan, grammar, sample texts, glossary, Berber history. Calassanti-Motylinski, G. A. de. 1905a. Le manuscrit arabo-berbere de Zouagha. In Act. XIV Congr. Intern. Orient., 69-78. PubLg: French. Cat: manuscripts, Zouagha. Calassanti-Motylinski, G. A. de. 1905b. Le nom berbere de Dieu chez les Abadhites. Revue africaine 49: 141-8. PubLg: French. Cat: lexicography, Abadhites. Calassanti-Motylinski, G. A. de. 1908. Grammaire dialogues et dictionnaire touaregs. Basset, Rene (ed.). Algiers. PubLg: French. Cat: grammar, Tuareg. Capot-Rey, R. and P. Marcais. No date. La charrue au Sahara. Travaux de l’Institut des Recherches sahariennes, vol. 9. PubLg: French. Cat: lexicography, Sahara, maps. Capot-Rey, R., et al. 1954-58. Un glossaire des termes geographiques arabo-berberes. Bull. Liais. sahar., vols. 5-9. PubLg: French. Cat: glossary, Arabic. Carrey, Emile. 1858. Recits de Kabylie. Paris. PubLg: French. Cat: sample texts, Kabyle. Carteret, George. 1929. The Barbary voyage of 1638. Philadelphia. PubLg: English. Cat: Berber language. Castries, Henri. 1905. Les Sources inedites de l’histoire du Maroc de 1530 a 1845. Paris. PubLg: French. Cat: Berber history, bibliography. Ceccherini, Ugo. 1915. Bibliografia della Libia. Rome. PubLg: Italian. Cat: bibliography, Libya, continues Minutelli 1903, includes items 1903-1914, accurate and complete. Cenival, Pierre de, Christian Funck-Brentano and Marcel Bousser. 1937. Bibliographie marocaine 1923-1933. Paris: Larose. PubLg: French. Cat: bibliography, Morocco, supplemented version of Hesperis bibliographies, complete and accurate. Cesaro, Antonio. No date. Ancora per gli studi berberistici in Italia. L’Oltremare, 172. PubLg: Italian. Cat: Berber language. Cesaro, Antonio. 1949. Due racconti in linguaggio nefusi. Analli, Istituto Universitario Orientale, Sezione Linguistica 3: 395-404. PubLg: Italian. Cat: sample texts, Jebel Nefusi. Chabot, J. B. 1917. Notes sur l’alphabet libyque. In Compte Rendus, Academie des inscriptions, orthography et belles-lettres, 558-64. PubLg: French. Cat: orthography, Libyan. Chabot, J. B. 1918. Punica. Paris. PubLg: French. Cat: orthography, Libyan. Chabot, J. B. 1940. Recueil des inscriptions libyques. Paris: Gouvernement General de L’Algerie. PubLg: French. Cat: orthography, Libyan, bibliography. Chabrolles, M. 1953. Proverbes imouchar. Bull. Liais. Sahar. 12: 34-7. PubLg: French. Cat: sample texts, Imouchar, comments by A. Picard. Chaker, Salem. 1973. Le Systeme Derivationnel Verbal Berbere (Dialecte Kabyle). These de Doctorat de Troisieme Cycle. Paris: Universite Paris III. PubLg: French. Cat: phonology, verbs, Kabyle. Chaker, Salem. 1975. Les parametres acoustiques de la tension consonantique en berbere (Kabyle). Travaux de l’Institut de Phonetique d’Aix 2: 151-68. PubLg: French. Cat: phonology, acoustics, consonants, Kabyle. Chaker, Salem. 1977. Problemes de phonologie berbere (Kabyle). Travaux de l’Institut de Phonetique d’Aix 4: 173-214. PubLg: French. Cat: phonology, Kabyle. Chaker, Salem. 1981. Les racines berberes triliteres a troisieme radicale alternante. Groupe linguistique d’etudes chamito-semitiques 18-23: 293-303. PubLg: French. Cat: phonology, morphology, morphophonology. Chaker, Salem. 1983. Un Parler berbere d’Algerie (Kabylie): syntaxe. Aix-Marseille: Publications Universite de Provence, J. Lafitte. PubLg: French. Cat: syntax, Kabyle. Chaker, Salem. 1984a. System des oppositions verbales (kabyle), formes et valeurs. In Textes en linguistique berbere: Introduction au domain berbere, 160-176. Chaker, Salem (auth.). Paris: Editions du Centre Nationale de la Recherche Scientifique. PubLg: French. Cat: morphology, verbs, Kabyle. Chaker, Salem. 1984b. Textes en linguistique berbere: Introduction au domain berbere (Laboratoire d’Anthropologie et de Prehistoire des Pays de la Mediterranee Occidentale, L. A. 164, Aix-en-Provence). Paris: Editions du Centre Nationale de la Recherche Scientifique. PubLg: French. Cat: Berber languages, orthography. Chaker, Salem. 1990. Les bases de l’apparentement chamito-semitique du berbere: un faisceau d’indices convergents. Etudes et Documents Berberes 7: 28-57. PubLg: French. Cat: comparative linguistics. Chaker, Salem. 1991. Une decennie d’etudes berberes (1980-1990), bibliographie critique. Algiers: Bouchenne. PubLg: French. Cat: bibliography. Chamberlayne, John. 1715. Oratio dominica in diversas linguas versa. Amsterdam. PubLg: Latin. Cat: Berber language, Tashlhiyt. Chantreaux, Germaine. 1941-42. Le tissage sur metier de haute lisse a Ait-Hichem et dans le Haut Sebaou. Revue africaine 85: 78-116, 212-29; 86: 261-313. PubLg: French. Cat: ethnography, Ait-Hichem, Haut Sebaou, Berber language, Kabyle. Charnock, R. S. 1892. Notes on the Kabyle Language. Imperial and Asiatic Quarterly Review, vol. 3, no. 6. PubLg: English. Cat: Berber language, Kabyle. Cherbonneau, A. 1859. Aicha poete de Bougie. Revue africaine 4: 34. PubLg: French. Cat: poetry, Bougie. Chottin, A. 1923. Airs populaires recueillis a Fes. Hesperis 33: 275-85. PubLg: French. Cat: songs, Fes. Chottin, A. 1933. Chants et danses berberes au Maroc. Le Menestrel, September. PubLg: French. Cat: songs, Morocco. Chtatou, M. 1982. Aspects of the Phonology of a Berber Dialect of the Rif. Ph. D. Thesis. London: The School of Oriental and African Studies, University of London. PubLg: English. Cat: phonology, Rifian. Cid Kaoui, S. 1894. Dictionnaire francais-tamaheq. Algiers. PubLg: French. Cat: glossary, Tamaheq. Cid Kaoui, S. 1900. Dictionnaire pratique tamaheq-francais. Algiers. PubLg: French. Cat: glossary, Tamaheq. Cid Kaoui, S. 1907. Dictionnaire francais-tachelh’it et tamazight. Paris. PubLg: French. Cat: glossary, Tashlhiyt, Tamazight. Clauzel, J. 1962. Des noms Songay dans l’Ahaggar. Journal of African Languages 7/1: 43-4. PubLg: French. Cat: lexicography, Songhay, Ahaggar. Cline, Walter. 1953. Berber dialects and Berber script. Southwestern Journal of Anthropology 9/3: 268-76. PubLg: English. Cat: dialect geography, orthography. Cohen, David. 1968. Les langues chamito-semitiques. Le langage. In Encycolopedie de la Pleiade. Paris: NRF-Gallimard. PubLg: French. Cat: comparative linguistics, Semitic languages. Cohen, David. 1972. Problemes de linguistique chamito-semitique. Revue des etudes islamiques 40: 43-68. PubLg: French. Cat: comparative linguistics, Semitic languages. Cohen, David. 1988. Le chamito-semitique. In Les langues dans le monde ancien et moderne III: 9-30. Perrot, Jean and David Cohen (eds.). Paris: Editions du Centre Nationale de la Recherche Scientifique. PubLg: French. Cat: comparative linguistics, Semitic languages. Cohen, Marcel. 1924. Le Systeme verbal semitique et l’expression du temps. Publications de l’Ecole des langues orientales vivantes, ser. 5, vol. 11. PubLg: French. Cat: historical linguistics. Cohen, Marcel. 1928. Genou, famille, force dans le domaine chamito-semitique. Memorial Henri Basset 1: 203-19. Paris. PubLg: French. Cat: historical linguistics. Cohen, Marcel. 1935. Sur l’affixe dans les verbes expressifs de diverses langues chamito-semitiques. In Melanges Maspero, 705-19. Cairo. PubLg: French. Cat: comparative linguistics, historical linguistics, morphology. Cohen, Marcel. 1947a. A propos du classement de la forme d’habitude dans la grammaire berbere. Comptes rendus du Groupe Linguistique d’Etudes Chamito-Semitiques 4: 37-40. PubLg: French. Cat: grammar, historical linguistics, comparative linguistics. Cohen, Marcel. 1947b. Essai comparatif sur le vocabulaire et la phonetique du chamito-semitique. Paris. PubLg: French. Cat: comparative linguistics, glossary, phonetics. Cohen, Marcel. 1949. L’ecriture dans la main chez les Touaregs et en Chine. Comptes rendus du Groupe Linguistique d’Etudes Chamito-Semitiques 5: 56. PubLg: French. Cat: orthography, Tuareg, Tifinigh, Chinese. Cohen, Marcel. 1958. La grande invention de l’ecriture et son evolution. Paris: Klincksieck. PubLg: French. Cat: orthography. Cohen, Marcel. 1969. Essai comparatif sur le vocabulaire et la phonetique du chamito-semitique. Paris: Champion. PubLg: French. Cat: comparative linguistics, Semitic languages, lexicography, phonetics. Colin, Georges S. 1924. Notes de dialectologie arabe: observations sur un vocabulaire maritime berbere. Hesperis 4: 175-9. PubLg: French. Cat: lexicography, dialectology. Colin, Georges S. 1926, 1927, 1930. Etymologies magribines. Hesperis 6: 52-82, 7: 85-102, and 10: 125-7. PubLg: French. Cat: historical linguistics, etymologies. Colin, Georges S. 1929. Le parler berbere des Gmara. Hesperis 9: 43-58. PubLg: French. Cat: Berber language, Gmara. Colin, Georges S. 1931. Noms d’artisans et de commercants a Marrakech. Hesperis 12: 229-40. PubLg: French. Cat: lexicography, Marrakech. Colin, Georges S. 1932. A propos d’un manuscrit berbere. Hesperis 14: 90. PubLg: French. Cat: manuscripts. Colin, Georges S. 1934. Une date dans l’histoire de la langue berbere. Hesperis 18: 201-2. PubLg: French. Cat: historical linguistics. Colin, Georges S. 1939. Observations etymologiques sur le vocabulaire Kabyle. In Melanges Gaudefroy-Demombynes, 301-12. Cairo. PubLg: French. Cat: historical linguistics, etymology, Kabyle. Colin, Georges S. 1957. Mots berberes dans le dialecte arabe de Malte. In Memorial Andre Basset, 7-16. Paris: A. Maoisonneuve. PubLg: French. Cat: historical linguistics, Maltese Arabic. Colin, Georges S. and H. Renaud. 1941. Ibn-al-h’acha. Rabat. PubLg: Arabic. Cat: glossary. Collins, Ridwan. 1981. Un Microcosme berbere: Systeme verbal et satellites dans trois parlers tunisiens. Revue de l’Institut des Belles Lettres Arabes 148/2: 287-303. PubLg: French. Cat: phonology, dialectology, grammer, verbs, Tunisia. Corso, Raffaele. 1930. Varianti arabo-berbere delle docidi parole della verita. Analli, Istituto Universitario Orientale, Sezione Linguistica 2: 3-15. PubLg: Italian. Cat: lexicography. Cortade, Jean-Marie. 1969. Essai de grammaire touareg. Algiers: Insitut de Recherches Sahariennes. PubLg: French. Cat: grammar, phonology, Tuareg. Coyne, A. 1879. Le Mzab. Revue africaine 23: 172. PubLg: French. Cat: Berber language, Mzab. Creusat, Jean Baptiste. 1873. Essai de dictionnaire francais-kabyle. Algiers. PubLg: glossary, Kabyle, grammar, Zuave, Djurdjura. Cros, Louis. 1918. Le Maroc pour tous. Paris. PubLg: French. Cat: glossary, Morocco. Cust, Robert N. 1883. A sketch of the modern languages of Africa. London. PubLg: English. Cat: Berber language, bibliography. Da Costa de Macedo, J. J. 1841. Ethnographical remarks on the original languages of the inhabitants of the Canary Islands. Jl. R. Geog. Soc. 11: 171-83. PubLg: English. Cat: ethnography, Berber language, Canary Islands, comparative linguistics. Dallet, Jean-Marie. 1944. Trois contes berberes. Revue de l’Institut des Belles Lettres Arabes 26: 206-9. PubLg: French. Cat: sample texts, Kabyle. Dallet, Jean-Marie. 1953. Le Verbe Kabyle: 1. Formes simples. Fichier de documentation berbere. Algiers: Fort-National. PubLg: French. Cat: morphology. Dallet, Jean-Marie. 1957. Notes detachees pour servir a l’etude de la syntaxe d’un parler. In Memorial Andre Basset, 17-26. Paris: A. Maisonneuve. PubLg: French. Cat: syntax, Tizi-Ouzou. Dallet, Jean-Marie. 1982. Dictionnaire Kabyle/Francais. Paris: Societe des Etudes Linguistiques et Anthropologiques de France. PubLg: French. Cat: glossary, Kabyle. De la Pena, Nunez. 1676. Conquista y antiguedades de les Islas de Gran Canaria. Madrid. PubLg: Spanish. Cat: Berber language, Canary Islands. Delaporte, J. Honorat. 1836a. Vocabulaire berbere. Journal Asiatique 3/1: 97-122. PubLg: French. Cat: glossary. Delaporte, J. Honorat. 1836b. Vocabulaire berbere-francais. Paris. PubLg: French. Cat: glossary. Delaporte, J. Honorat. c. 1840. Grammaire de la langue berbere. Paris. PubLg: French. Cat: grammar. Delaporte, J. Honorat. 1844. Specimen de la langue berbere. Paris. PubLg: French. Cat: Berber language. Delaye, Theophile Jean. 1930. Aux casbahs berberes du grand Atlas marocain. Annls. Col., August. PubLg: French. Cat: ethnography, Atlas, Morocco, Berber language. Dell, Francois and Mohamed Elmedlaoui. 1985. Syllabic Consonants and Syllabification in Imdlawn Tashlhiyt Berber. Journal of African Languages and Linguistics 7/2: 105-130. PubLg: English. Cat: phonology, syllabification, generative phonology, Tashlhiyt, Imdlawn. Dell, Francois and Mohamed Eldmedlaoui. 1988. Syllabic Consonants in Berber: Some New Evidence. Journal of African Languages and Linguistics 10/1: 1-17. PubLg: English. Cat: phonology, syllabification, syllabic consonants, versification, gemination. Dell, Francois and Mohamed Elmedlaoui. 1989a. Clitic Ordering, Morphology and Phonology in the Verbal Complex of Imdlawn Tashlhiyt Berber, Part I. Langues Orientales Anciennes Philologie et Linguistique 2: 165-94. PubLg: English. Cat: morphology, phonology, morphophonology, verbs, clitics, Tashlhiyt, Imdlawn. Dell, Francois and Mohamed Elmedlaoui. 1989b. Clitic Ordering, Morphology and Phonology in the Verbal Complex of Imdlawn Tashlhiyt Berber, Part II. Langues Orientales Anciennes Philologie et Linguistique 3: 77-104. PubLg: English. Cat: morphology, phonology, morphophonology, verbs, clitics, Tashlhiyt, Imdlawn. Dell, Francois and Mohamed Elmedlaoui. 1992. Quantitative transfer in the nonconcatenative morphology of Imdlawn Tashlhiyt Berber. Journal of Afroasiatic Languages 3: 89-125. PubLg: English. Cat: morphology, Tashlhiyt, Imdlawn. Dell, Francois and Mohamed Elmedlaoui. 1996. Consonant release in Berber (approx. title). Linguistics, vol. 34. PubLg: English. Cat: phonology. Dell, Francois and Abdelkrim Jebbour. 1991. Phonotactique des noms a voyelle initiale en berbere (chleuh de Tiznit, Maroc). Linguistic Analysis 21: 119-147. PubLg: French. Cat: phonology, nouns, Tashlhiyt, Tiznit, Morocco. Dell, Francois and Abdelkrim Jebbour. 1995. Sur la morphologie des noms en berbere (chleuh de Tiznit, Maroc). Langues Orientales Anciennes. Philologie et Linguistique 5-6: 211-32. PubLg: French. Cat: morphology, nouns, Tashlhiyt, Tiznit, Morocco. Dell, Francois and Oufae Tangi. 1992. Syllabification and Empty Nuclei in Ath Sidhar Rifian Berber. Journal of African Languages and Linguistics 13/2: 125-62. PubLg: English. Cat: phonology, morphology, syllabification, Rifian, Ath Sidhar. Depont, Octave. 1933. Vocabulaire francais-kabyle. Bordeaux. PubLg: French. Cat: textbook, Kabyle, grammar, sample texts, glossary. Dermenghem, Emile. 1945. Contes kabyles. Algiers. PubLg: French. Cat: texts, Kabyle. De Samuda, -. 1840. Essai sur la langue des Beni-Mzabs. Mon. Alg. PubLg: French. Cat: Berber language, Beni-Mzabs. Destaing, Edmond. 1905. L’ennayer chez les Beni-Snous. In Revue africaine, 51-70. PubLg: French. Cat: sample texts, Beni-Snous, Algeria. Destaing, Edmond. 1906. Fetes et coutumes saisonnieres chez les Beni-Snous. Revue africaine 50: 244-60, 362-85. PubLg: French. Cat: ethnography, Beni-Snous, texts. Destaing, Edmond. 1907-11. Etude sur le dialecte berbere des Beni-Snous. Bulletin de correspondance africaine 34-5. Paris: Leroux. PubLg: French. Cat: Berber language, Beni-Snous, grammar, sample texts. Destaing, Edmond. 1914. Dictionnaire francais-berbere. Algiers. Bulletin de correspondance africaine 49. PubLg: French. Cat: glossary, supplement to Destaing 1907-11. Destaing, Edmond. 1919. Note sur la conjugaison des verbes de forme C1 and C2. Memoires, Societe de Linguistique de Paris 21: 139-48. PubLg: French. Cat: morphology. Destaing, Edmond. 1920a. Etude sur le dialecte berbere des Ait Seghrouchen. Bulletin de correspondance africaine 56. Paris: Leroux. PubLg: French. Cat: Berber language, central Morocco. Destaing, Edmond. 1920b. Etude sur la tachelhit du n. Vocabulaire francais-berbere. Bibliotheque de l’Ecole des langues orientales vivantes, vol. 7. Paris. PubLg: French. Cat: lexicography, Tashlhiyt. Destaing, Edmond. 1921. Note sur le pronom demonstratif en berbere. Bulletin de la Societe d’Archeologie Copte 22: 186-200. PubLg: French. Cat: morphology. Destaing, Edmond. 1925. Interdictions de vocabulaire en berbere. Melanges Rene Basset 2: 177-277. Paris. PubLg: French. Cat: lexicography, sample texts, Tashlhiyt, bibliography. Destaing, Edmond. 1928, 1931. Notes sur l’expresion verbale de la duree du Temps en berbere et en arabe marocain. Bulletin de la Societe d’Archeologie Copte 29: 45-73, 31: 1-33. PubLg: French. Cat: comparative linguistics, Tashlhiyt, Moroccan Arabic. Destaing, Edmond. 1930. L’expression verbale de l’etat et de la duree dans les parlers berberes marocains. Bulletin de la Societe d’Archeologie Copte 30: 9-10. PubLg: French. Cat: Berber language. Destaing, Edmond. 1934. Les particules d et n en berbere. Comptes rendus du Groupe Linguistique d’Etudes Chamito-Semitiques, vol. 2. PubLg: French. Cat: morphology. Destaing, Edmond. 1935a. Notes sur le verbe passif. Comptes rendus du Groupe Linguistique d’Etudes Chamito-Semitiques, vol. 2. PubLg: French. Cat: morphology. Destaing, Edmond. 1935b. Sur l’expression dans le verbe berbere de l’irreel par l’emploi de la forme dite d’habitude. Bulletin de la Societe d’Archeologie Copte, vol. 35. PubLg: French. Cat: morphology. Destaing, Edmond. 1937a. Entretien sur le question des labio-velaires en chamito-semitique: berbere. Comptes rendus du Groupe Linguistique d’Etudes Chamito-Semitique, vol. 3/7. PubLg: French. Cat: phonology, labio-velarization. Destaing, Edmond. 1937b. Remarques sur le genre grammatical de quelques noms dans le parler arabe des Chleuhs du Sous. In Melanges Gaudefroy-Demombynes, 173-88. Cairo. PubLg: French. Cat: morphology, Tashlhiyt, Arabic, comparative linguistics, Sous. Destaing, Edmond. 1937c. Sur les pronoms walli, wanna. Comptes rendus du Groupe Linguistique d’Etudes Chamito-Semitiques, vol. 2. PubLg: French. Cat: morphology. Destaing, Edmond. 1937d. Textes arabes en parler des chleuhs du Sous. Paris. PubLg: French. Cat: Arabic texts, Tashlhiyt, glossary, Sous. Destaing, Edmond. 1938a. Etude sur la Tachelhit du Sous, Vocabulaire Francias-Berbere. Paris: Leroux. PubLg: French. Cat: Berber languages, Tashlhiyt, Sous. Destaing, Edmond. 1938b. Remarques sur le qualification en Tachelhit du Sous. Comptes rendus du Groupe Linguistique d’Etudes Chamito-Semitiques, vol. 3. PubLg: French. Cat: syntax, Tashlhiyt, Sous. Destaing, Edmond. 1938c. Vocabulaire francais-berbere. Paris. PubLg: French. Cat: glossary. Destaing, Edmond. 1940. Textes berberes en parler des chleuhs du Souss [Maroc]. Paris: Librarie Orientaliste Paul Gueuthner. PubLg: French. Cat: sample texts, Tashlhiyt, glossary, Sous. Devaux, Charles. 1859. Les Kebailes du Djerjera. Marseille. PubLg: French. Cat: Berber language, Kabyle. Diakonoff, I. M. 1988. Afrasian Languages. Reedition revisee. Moscow: Nauka. PubLg: English. Cat: comparative linguistics, Semitic languages. Donner, Herbert and Wolfgang Rollig. 1968-73. Kanaanaische und aramaische Inschriften. Wiesbaden: Harrassowitz. PubLg: German. Cat: Berber language, orthography, 3 vols. Doutte, Edmond. 1914. Missions au Maroc. Paris. PubLg: French. Cat: ethnography, Morocco, Berber language. Doutte, Edmond and E. F. Gautier. 1913. Enquete sur la dispersion de langue berbere en Algerie. Algiers. PubLg: French. Cat: dialect geography, Algeria. Dresch, Jean. No date. Documents berberes: Atlas central. Publication de l’Institut des Hautes Etudes Marocaines 35. Paris. PubLg: French. Cat: manuscripts, Atlas. Drummond-Hay, John. 1844. Western Barbary. London. PubLg: English. Cat: Berber language. Dubie, P. 1942. L’ilot berberophone de Mauritanie. Bulletin de l’Institut Francais d’Afrique Noire. PubLg: French. Cat: Berber language, Mauritania. Ducati, Bruno. No date. Le lingue parlate nelle nostre colonie. L’Oltremare 220-1. PubLg: Italian. Cat: Berber language. Du Ponceau, Peter S. 1830. Grammatical sketch and specimens of the Berber language. Philadelphia. PubLg: English. Cat: Berber language, letters to William Hodgson. Durand, Olivier. 1993. Qu’est-ce qu’une lange berbere? Hypothese diachronique. In Rendiconti, series IX, vol. IV: 91-109. Rome: Atti della accademia nazionale dei lincei. Anno cccxc-1993, Classe di scienze morali, stroriche e philologiche. PubLg: French. Cat: Berber language, historical linguistics(?). Duveyrier, Henri. 1864. Exploration du Sahara. Paris. PubLg: French. Cat: ethnography, Sahara, Tuareg, sample texts. Elmedlaoui, Mohamed. 1985. Le parler berbere chleuh d’Imdlawn: segments et syllabation. Doctorat de Troisieme Cycle. Saint-Denis: Universite de Paris VIII. PubLg: French. Cat: phonology, syllabification, Tashlhiyt, Imdlawn. Elmedlaoui, Mohamed. 1992. Aspects des representations phonologiques dans certaines langues chamito-semitiques. These de Doctorat d’Etat. Rabat: Universite Mohamed V, Faculte des Lettres et des Sciences Humaines. PubLg: French. Cat: phonology, comparative linguistics, Semitic languages. Elmedlaoui, Mohamed. 1993. Gemination and Spirantization in Hebrew, Berber and Tigrinya: A Fortis-Lenis Module Analysis. Linguistica Communicatio 5: 121-76. PubLg: English. Cat: phonology, prosody, gemination, spirantization, comparative linguistics, Hebrew, Tigrinya. Elmedlaoui, Mohamed. 1994. Extension de la racine en chamito-semitique. Linguistique Africaine 12: 93-118. PubLg: French. Cat: morphology, comparative linguistics, Semitic languages. Elmedlaoui, Mohamed. 1995. Geometrie des restrictions de cooccurrence de traits en semitique et en berbere: synchronie et diachronie. Canadian Journal of Linguistics/Revue canadienne de linguistique 40/1: 39-76. PubLg: French. Cat: phonology, prosody, morphology, morphophonology. Elmoujahid, E. 1979. Presentation des phonemes de la langue tamazight: la tachelhit d’Igherm (Souss). Traces 2: 52-78. PubLg: French. Cat: phonetics, Tamazight, Tashlhiyt, Igherm, Sous. Elmoujahid, E. 1981. La Classe du Nom dans un Parler de la Langue Tamazight: le Tachelhiyt d’Igherm (Souss-Maroc). These de Doctorat de Troisieme Cycle, Universite Rene Descartes Paris V. Paris: Sorbonne. PubLg: French. Cat: morphology, nouns, Tamazight, Tashlhiyt, Igherm, Sous, Morocco. Elmoujahid, E. 1993. La Syntaxe du Groupe Nominal en berbere tachelhit. These de Doctorat d’Etat. Rabat: Faculte des Lettres et des Sciences Humaines. PubLg: French. Cat: syntax, nouns, Tashlhiyt. Ennaji, M. and F. Sadiqi. 1986. The Syntax of Cleft Sentences in Berber. Studies in Language 10: 53-66. PubLg: French. Cat: syntax, cleft sentences. Faidherbe, Louis L. 1870. Collection complete des inscriptions numidiques. Paris. PubLg: French. Cat: orthography, Libyan. Faidherbe, Louis L. 1877. Le Zenaga des tribus Senegalaises. Paris. PubLg: French. Cat: Berber language, Zenaga. Feraoun, Mouloud. 1960. Les Poemes de Si Mohand. Paris. PubLg: French. Cat: poetry, Si Mohand, Kabyle, metrics. Feraud, -. 1858. Bracelet de Touareg avec une inscription en Tifinar. Revue africaine 3: 396. PubLg: French. Cat: inscriptions, orthography, Tuareg, Tifinigh, Ahaggar. Fevrier, J. G. 1953. La prononciation punique des noms propres latins en –us et en –ius. In Journal Asiatique, 465-71. PubLg: French. Cat: phonology, Phonecian. Fevrier, J. G. 1956. Que savons-nous du libyque? Revue africaine 100: 263-273. PubLg: French. Cat: historical linguistics. Flamand, Georges B. M. 1901. Hadjrat Mektoubat ou les pierres ecrites. Bulletin, Societe d’anthropologie et de biologie de Lyon. June. PubLg: French. Cat: inscriptions, orthography. Flamand, Georges B. M. 1921. Les Pierres ecrites. Paris. PubLg: French. Cat: inscriptions, orthography, North Africa. Flores Morales, A. 1943. El dialecto bereber en Marruecos. Africa, February 1943, 30-3. PubLg: Spanish. Cat: Berber language, Morocco. Foucauld, Charles de. 1888. Reconnaissance au Maroc. Paris. PubLg: French. Cat: Berber history. Morocco. Foucauld, Charles de. 1918-20. Dictionnaire abrege touareg-francais. Basset, Rene (ed.). Algiers: Carbonel. PubLg: French. Cat: glossary, Tuareg, Ahaggar, 2 vols. Foucauld, Charles de. 1920. Notes pour servir a un essai de grammaire Touaregue. Basset, Rene (ed.). Algiers: Carbonel. PubLg: French. Cat: grammar, Tuarag. Foucauld, Charles de. 1925-30. Poesies touaregues. Basset, Rene (ed.). Paris. PubLg: French. Cat: poetry, Tuareg, Ahaggar. Foucauld, Charles de. 1940. Dictionnaire abrege touareg-francais des noms propres. Paris. PubLg: French. Cat: glossary, Tuareg. Foucauld, Chalres de. 1951-52. Dictionnaire touareg-francais. Paris. PubLg: French. Cat: glossary, Tuareg, Alhaggar, 4 vols. Foucauld, Charles de and A. de Calassanti-Motylinski. 1922. Textes Touareg en prose. Basset, Rene (ed.). Algiers: Carbonel. PubLg: French. Cat: sample texts, Tuareg, Ahaggar. Foureau, Fernand. 1894. Rapport sur ma mission au Sahara. Paris. PubLg: French. Cat: Berber language. Foureau, Fernand. 1896. Essai de catalogue des noms arabes et berberes de quelques plantes, arbustes et arbres algeriens et sahariens. Paris. PubLg: French. Cat: lexicography, Arabic, Algeria, Sahara. Freeman, Henry S. 1862. A grammatical sketch of the Temahug or Tuareg language. London. PubLg: English. Cat: grammar, Tuareg. Freeman, Henry S., and H. Aucapitaine (trans.). 1864. Dialecte de Ghat. Revue africaine 8: 396. PubLg: French. Cat: Berber language, Ghat, Tuareg. Fribourg, Andre. 1922. L’Afrique latine. Paris. PubLg: French. Cat: Berber history. Friedrich, Johannes. 1966. Geschichte der Schrift. Heidelberg: Winter. PubLg: German. Cat: orthography. Frobenius, Leo. 1921-28. Volksmarchen der Kabylen. Atlantis. PubLg: German. Cat: sample texts, Kabyle.